Andy Wallace helped out Duncan Dayton’s Highcroft Racing earlier this season, in initial testing of the team’s ex-Dyson Lola B01/60 AER – and now it’s confirmed that the experienced Englishman will be racing the car in five ALMS events this year: Lime Rock Park (June 29-July 1), Miller Motorsports Park in Salt Lake City (July 13-15), Portland International Raceway (July 20-22), Road America (Aug. 17-20) and Mazda Raceway Laguna Seca (Oct. 19-21). 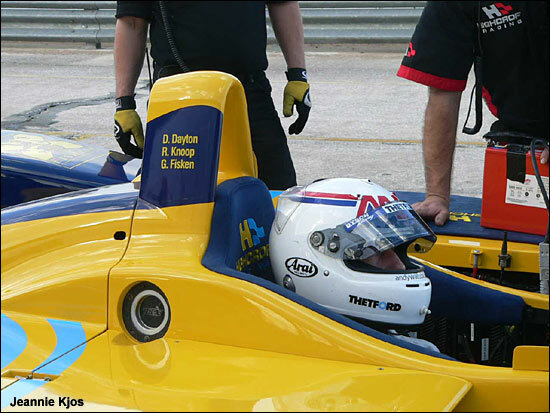 "We're thrilled for the opportunity to work with a driver of Andy Wallace's caliber and experience, and we hope his participation will help jump-start Highcroft's efforts as we build for 2007," commented Duncan Dayton. "We worked with him in pre-season testing, and he was a treat to work with. He's a gentleman, and he brings a great knowledge of set-ups that we hope will accelerate our learning curve with the Lola. His experience on Michelins should also be helpful to us as we help to develop our Dunlop tires. I want to thank Rob [Dyson] for making him available to us for these five events." Wallace will be driving for Dyson Racing at Petit Le Mans. "First, I want to say what a wonderful team Highcroft Racing is," said Andy Wallace. "Everybody who saw the presentation they made at Sebring was impressed. The standard of preparation of the car and everything in the pits and the paddock was first rate. Duncan and his staff do everything first class. "It's a beautiful car and it's really nice to drive. I know the number was different but it's effectively my car from last year, so it will be nice to drive it again." With a full season in Grand Am, that’s Andy Wallace’s season just about complete – although we hope to be writing about his Le Mans drive very soon.